Lynn Kohr is the Breeder Futurity Champion/Open Futurity Reserve Champion with Dashing Misty Isle. A new location and earlier date for the Bold Heart Futurity brought barrel racers from all across the country to Lincoln, Neb., August 27-29, 2010. A South Dakota standard for a couple of decades, Pam VanKekerix’s vision and demonstrated forward thinking brought the Bold Heart Futurity closer to the heart of barrel racing. The move paid off. Record prize money, a Master Trophy Saddle and Bob Berg Buckles went home with Breeder Futurity winners from Wyoming, Oklahoma, and South Dakota. Zip codes included top futurity jockeys from across the country, many gathered to test drive the fabulous Lancaster Event Center – home to the WPRA World Championships later this fall. Topping the $12,000 added Breeder Futurity by sweeping both go-rounds, Wyoming’s Lynn Kohr, rode Dashing Misty Isle, Kim Sanford’s brown daughter of Dashing With Cash, to the tune of $4,600 cash and the saddle. Kohr rode the mare through two near perfect patterns in her classic style, and with her also classic graciousness said: “Kim (Sanford) will be so thrilled for this mare, I am so excited to tell her she won a saddle!” A reserve championship in the $2,000 added Open 2D Futurity topped off the weekend for the Kohr/Dashing Misty Isle team adding another $1,600 in gas money for the trip home. Dashing Misty Isle is out of Cashin Mito, by Wakeup Runnin. Reserve Breeder Futurity Champion, Cheryl Magoteaux, piloted Bet This Is a Shiner (Miss Betty) to back-to-back reserve times in both go rounds, $3,500 and the Bob Berg Reserve Champion Buckle. Miss Betty is busy racking up a barrel racing resume in a hurry for her sire, reining and reined cow horse legend – Shining Spark. She is owned by Magoteaux and Floyd Miller, and is out of Better Bet On Me, by First Down Dash. Magoteaux, of Byars, OK, is better know by most in the equine industry as a management, broadcasting, and publishing entrepreneur; with her ProManagement Company putting on events like the National Reining Breeders Classic and the National Reined Cow Horse Snaffle Bit Futurity in her daily routine. Riding Miss Betty however, brings her back to her first love – barrel racing. Magoteaux said: “I am just letting her come along at her own pace, and she is such a joy for me.” A fourth place finish in the Open Futurity added to the fun for her as well. Stephanie Newman ably represented South Dakota’s finest, as she ended up third in the Breeder’s Futurity riding her own gelding – Frenchies Easy Cash. The sorrel son of Frenchmans Guy gave her lots to smile about, as the dynamic young team racked up the championship for the Breeder Amateur, and the Open Amateur Futurity Championship as well. Rounding out the top five in the Breeder Futurity were ReAnn Zancanella, riding Hot Pana Jet – by Hot Dasher and owned by R2M2Z Performance Horses, and Cody Bauserman, on Doittiem Lil Martha – By Frenchman’s Guy and owned by Sharon Bryant. Topping the $2,000 added Open Futurity was UX Heza Red Man, a sorrel son of Heza Fast Man, owned and ridden by Samantha Flannery. As noted Kohr and Dashing Misty Isle took the reserve, and Watch Doc Dash, owned and ridden by Lana Brown took third. Watch Doc Dash is by Miss N Cash. The $1,500 added Breeder Derby/Maturity championship went to Colours of Shadows, a 5-year-old daughter of Hot Colours. She was ridden by Carisa Shearer and is owned by Carisa Diedrichs and Andrea Peterson. Reserve went to Breeder Futurity Champion Lynn Kohr, this time riding Lil Dashing Blitz. 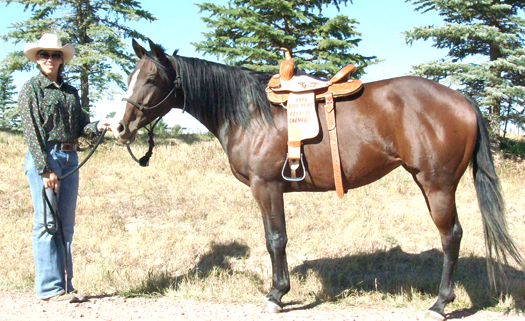 This 6-year-old daughter of Dashing With Cash is owned by Kohr Quarter Horses. Third in the Derby/Maturity was won by Sandy Harms, riding Freckles Frenchman, her own son of Frenchmans Guy. Fourth went to Kami Ireland’s 6-year-old stallion by Runnerelse – Juliohs Last Runner. Hallie Melvin piloted the tall sorrel. Fifth place also went to a stallion – My Stud Leroy, by Dash For Perks. He is owned by LD Ranch and was ridden by Lacey Kuschel. Tatum Hughes of Carmen, OK, was the talented and humble youth champion. A delightful and competitive 10-year-old, her dad Doug, shared that she has a trailer, saddles and a drawer full of buckles in her resume. Hughes rode their 4-year-old mare, Dashing Like A Streaker, to the victory in Lincoln. Rose Ann Ewan, owner and rider of Open Futurity entry Starbert U Linc, asked to share her deepest thanks to futurity producer Pam VanKekerix, gate man Tom Dooley, and event veterinarian Dr. Shanda Myers. Everyone’s heart stopped late in the day Saturday when her beautiful and talented gray went down on her after rounding the third barrel. With only three runners to go to finish the first go-round, VanKekerix made the courageous decision to stop the futurity for as long as it took to diagnose and treat Ewan’s horse. At first things looked very grim, and a rush to judgment could have ended in tragedy. But after 3 hours of treatment, the horse was able to rise on his own and was doing much better by the end of the futurity. Although the delay cost inconvenience for many, it saved the life of the horse. Ewan and the entire futurity staff thank the very gracious competitors who spoke out saying: “These things just happen; I would sure want that kind of care for my horse; it was not a problem to wait.” There are many classy people in the futurity world and it was good to hear from them in support of the management decision. Ewan reports that her horse is continuing to improve daily. Two vigorous 4D WPRA co-sanctioned races wrapped up the busy weekend. A very special futurity feature was a dinner Saturday night co-hosted by Joyce Kernek and Jeani Reiman, in a unique blend of barrel horse lore, cowboy church, and just plain catching up with old friends (and making new ones).